For Chipotle Sauce: Place Mexican crema, chipotle chiles, adobo sauce, garlic clove and salt in blender and mix until smooth. Set aside. For Tuna Patties: In a large mixing bowl, place tuna, eggs, onion, cilantro, garlic salt, and lime juice, and stir until all ingredients are well mixed. Heat olive oil in skillet over medium heat. Form small patties with tuna mixture, approximately 1 1/2 to 2 inches wide and about 1/2 inch thick. Cook for approximately 3 minutes or until golden brown and flip to cook other side. Remove from heat and place on paper towel lined plate to drain excess oil. Serve immediately and top with chipotle cream sauce. You can replace the Mexican crema with Greek yogurt for a more nutritional option. I have great memories of my mother’s cooking during Lent. I would get home from school and the whole house would smell like fish, lentils, sautéed shrimp and veggies. For 40 days my mother would treat us to a variety of meatless entrees, my favorites being shrimp broth, pipian with nopalitos and tuna patties. 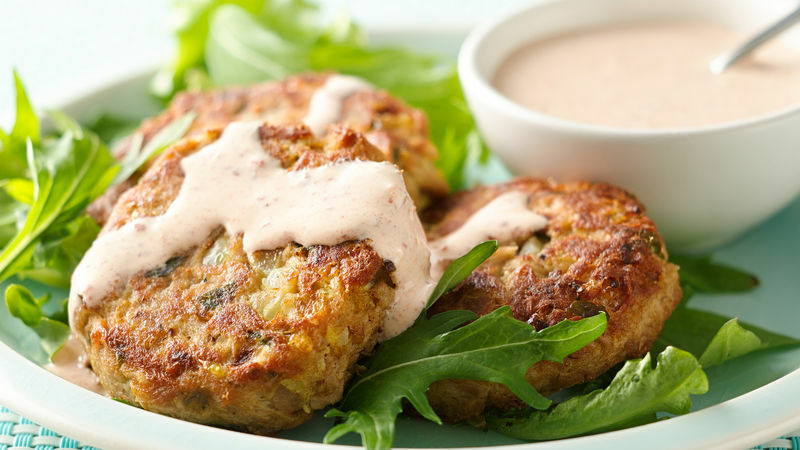 Tuna patties are made with simple ingredients and taste delicious. In this recipe, I pair them with a spicy chipotle sauce that adds an extra kick of flavor. Give them a try this Lent season, I guarantee they will be in your dinner menu year-round!